I’ve been noticing a new crop of high-end fast casual franchise concepts that are the size and atmosphere of a traditional sit down restaurant, but orders are taken at the walk-up counter. Ingredient in Kansas City comes to mind. They follow the recent trend of hearth oven baked pizza, homemade pastas, salads and sandwiches. 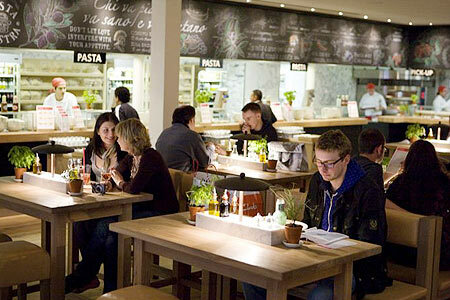 Vapiano is also an interesting urban-only concept started in Germany and now here in the USA. It is a very modern, high-end Italian fast casual concept. The chefs are stationed around the dining room, and customers walk up to the chefs who prepare their order right there. A customer’s food and drink totals are tracked using a chip card similar to one you’d see on cruise boats. As the customer leaves the card is scanned and the customer pays. It sounds a bit like a modern cafeteria but the architecture is sleek and hip. The average check ranges from $14.50 to $22, depending on whether it’s lunch or dinner, claims the owner.